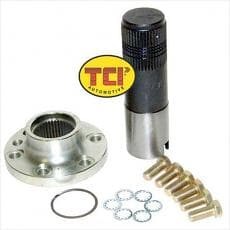 TCI Circlematic Transmission, Manual/FWD - Circle Track Supply, Inc.
New TCI® circle track racing-specific transmission features repositioned filter to avoid fluid starvation and incorporates total gear selection control. Having total control of your racecar is the key to winning. 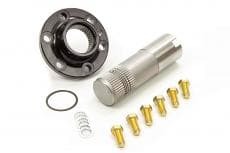 That reasoning not only applies to suspension and steering operations but also to having total command of your drivetrain to put the power down when you need it. The new TCI® Circlematic™ Powerglide Full Manual Transmission with a Kickout-Style Asphalt Pan features a full manual valve body to ensure that the gear you want is the gear you get. Furthermore, it can be raced in either high or low gear to match the size of the track where you are racing or your race car’s current rear gearing. 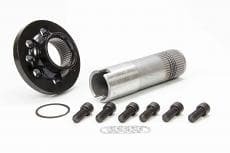 Best of all, for highly demanding circle track competition where hard cornering can lead to transmission oil starvation, this transmission incorporates a kickout-style pan that moves the filter outboard and deeper into the fluid, regardless of the conditions. The TCI® Circlematic™ Powerglide Full Manual Transmissions with Kickout-Style Asphalt Pans are equipped with all the superior internal components you’ve come to expect from TCI®, including Alto clutches, Kevlar band, steel hub, blueprinted pump and heavy-duty 1.82:1 ratio planetary gearing. 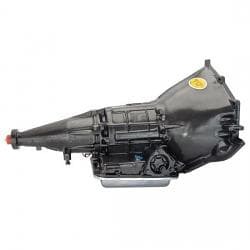 The rotating weight of the transmission is less than other manual transmissions so you benefit from less engine drag, as well. And of course, all TCI® transmissions are triple-tested on the Axiline dyno to ensure proper operation and feature the propriety HDT (Heat Dissipating Technology™) Coating™ that reduces overall operating temperatures.